Despite efforts to reduce, reuse, and recycle, many cities are struggling to maintain their municipal waste programs. Recycling, which is often touted as the gold standard of being green has been found to be quite costly for cities to run and many residents are doing it incorrectly. Using existing technology, could there be a meaningful way to reduce consumption? I designed a refuse system and accompanying app that will encourage and incentivize people to throw away less non-recyclable garbage. So before we get down and dirty I need to come clean. This is a school project. Wait! Don’t close that browser just yet! There are some good tidbits of information here. Also, I did this project solo, so you can be assured this is all my work. I’ve included slides from my final presentation to make scanning this section a bit easier. The prompt, as you can see in the slide below, requested a solution that was doable with today’s technology. Just as we saw with the Maternal Monitoring App, I always start with defining the problem and I do that by exploring the scope of the problem and understanding who the players are in the situation. Just how bad this is problem? Oy, it’s bad. And recycling more really isn’t the answer. We need to go up stream but do we ask people to throw away less or ask factories to make less? Since we live in a capitalist society is seems that it would make the most sense to get people to change their behavior but what is their current behavior and feelings? Let’s find out. I found that people were largely indifferent about their waste. We could go on and on about the importance of recycling and how bad garbage is to the environment but at the end of the day, trash disappears from not only the curbside but our mind. It was at this point that I started to explore the way that garbage collection is done in our community (Austin-Round Rock). In our city we pay a flat rate per household. I does not matter if you throw away one can or a mountain of trash, you pay the same amount. The retiree who rinses her paper towels and leaves them out to dry (yes, I know people who do this), pays the same amount as the frat house next door. I started to wonder if this is the best way to go about billing for trash pickup. If we’ve established that we have to change behavior in order to get any meaningful change to our trash problem, how can we motivate people to change? For this task I thought back to Drive Reduction Theory. I wont bore you with the details of Hull and Spence’s work but suffice it to say that I found their work useful when listing out what drives that I should focus on. And in this case it was the drives of Greed and Competition. Alright, back to the solution. I found out that the flat rate model doesn’t work as evidenced by our city’s literal mountain of “data” and the notion of being a good steward to the earth has not motivated people to waste less. Other utilities such as water, electricity, and gas all pay according to consumption. People are cognizant of their power usage because they get a bill at the end of every month that tells them not only what they have used but how much it costs and compares it with the previous month. Why don’t we do it with trash? After all, it seems only fair to pay for what you need hauled away. The system is actually in place in a lot of cities. It’s called PAYT (PAY-it) and it stands for “Pay As You Throw”. I used to live in a PAYT city. We had to pay for these special city garbage bags or tag our bags. The more trash we threw away, the more tags we would need. Each bag of trash cost about $1.25. So does PAYT programs lead to less waste? YES! Nice! It’s always good to back up ideas with receipts. But do we need to go the tag route? Could there be an easier way? What if there was a scale on the truck? The trashcan? Maybe have it all connect with an app? So here I started drawing out more ideas and came up with a potential solution. Here’s how I drew them out. People are throwing away a ton of trash because there is little to no incentive to conserve. We will create incentive by charging by weight. This system is fair and its efficacy is backed by research. So how are we going to charge by weight? Aha! The technology exists! Everyone in our targeted communities already uses a standard municipal city trash can so we can use it as a tare. 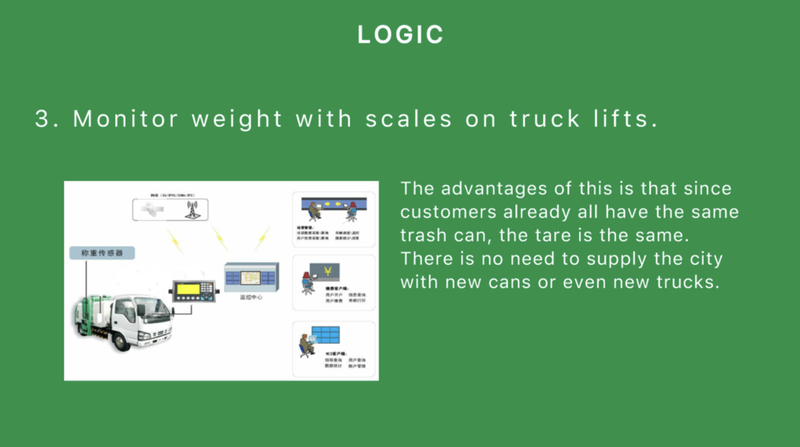 An arm scale, which has been developed in China and used throughout the United States in dumpster collection, can be attached to garbage trucks already in use. We’re in the flow. We are coming up with solutions. This is great! But how is all this going to be delivered to the customer? I mentioned competition as a potential motivator. How is that going to fit into this puzzle? Last I heard competitive trash “throwing-awaying” wasn’t a thing. I started to brainstorm how people are made aware of information. We receive bills in the mail that tell us about our utility usage and rationale for the price. And, we could certainly do that, but wouldn’t it make more sense if a program that is designed around conservation used a digital medium to inform? 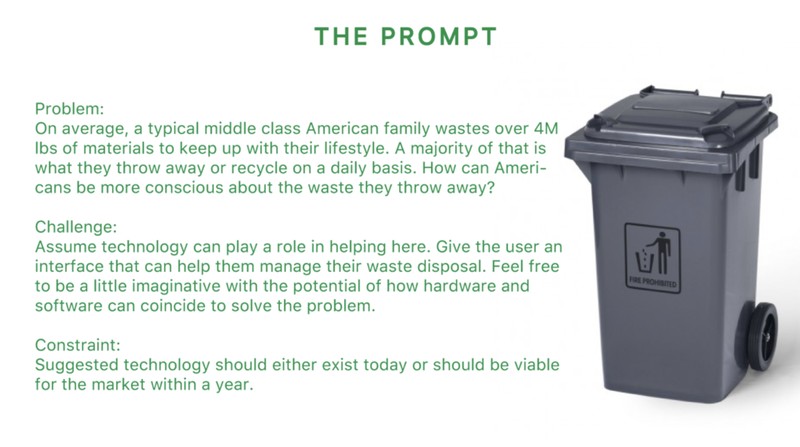 In this prototype I wanted people to understand how much they threw away, how it affects their bills, and how their trash volume compares with their neighbors and similar sized households. I tested the prototype with my classmates by asking them to complete various tasks and having them speak out loud of their thoughts during the process. What I found out was that my app was initially pretty difficult to navigate. With the data I gathered from my tests, I created a second version of the app. I fixed the navigation issues, developed a design schematic with bright colors and drew up an adorable raccoon mascot (well, I think he is adorable) who will periodically shame you for being wasteful. There wasn’t time to test this version of the app but it was a delight to make. By using psychological principals and theories, we can potentially create change in behavior. A great deal of research is usually already on hand. Always check peer reviewed articles for good, unbiased research. Map out your logic, this can help support your choices.